New Delhi: The Finance Minister Arun Jaitley on Monday launched a mobile app named 'Aaykar Setu' allowing taxpayers perform basic functions through their smartphone. Paying income tax, applying for PAN and seeking redressal of grievances have become easier as the tax department new app allowing taxpayers perform basic functions through their smartphone. The mobile app 'Aaykar Setu' will also help people link their 12- digit biometric identifier Aadhaar with Permanent Account Number (PAN) card as well as track the TDS deduction details. The mobile app 'Aaykar Setu', literally means bridge for taxpayers and will be available on Android phones. The Finance Minister Arun Jaitley said "This is a very important step forward by the CBDT and the principle reason being technology as a very powerful tool becomes an enabler. (With the app) most of the work the assessee can discharge without any external help sitting at home,"
The app will have a live chat facility named 'Chatbot' from 10 am to 6 pm which will provide a solution to queries of taxpayers relating to PAN, TAN, TDS, return filing, refund status and tax payments. Besides, people can also have a live chat with tax experts and provides an address of nearby tax return preparer. It provides ease of use of all the services related to tax payment including tax payment, tax calculation. Also if a taxpayer has a problem, this app will help in lodging his grievance in the e-Nivaran module of the CBDT. The taxpayers will also be able to receive regular updates regarding important tax dates, forms, and notifications on mobile numbers registered with the ITD. The app will also have a section as 'tax gyaan' which will be a multiple choice question web-based game to provide knowledge to the youth accessible from mobile as well as desktop. "The app reduces the physical interface between assessing officer (AO) and assessees. Physical interface has many unintended consequences - it is time-consuming and can lead to improprieties," Jaitley said. The tax department, he said, has endeavoured to reduce interface and a lot of it has already happened. The app will make it "far more convenient" and make compliance easy. "It also helps us in improving the image of the department. For the reason that one of the not so acceptable alibis given by those who don't comply is we don't comply because of the harassment that compliance involves. Not that this reason has much reason in it, but today this reason gets eliminated more the interface is reduced," he said. 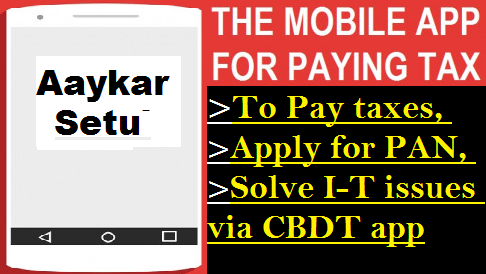 Downlod 'Aaykar Setu' mobile app To Pay taxes, Apply for PAN, Solve I-T issues via CBDT app, Highlights Of the 'Aaykar Setu' mobile app, This is the first mobile app by the CBDT and can be downloaded by giving missed calls to 7306525252.